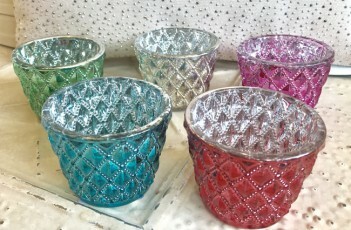 Choose from a selection of colourful, glass, tealight holders (Front row left to right; blue or red. Back row left to right; green, silver or pink). Each measures 7.5cm wide at the top and 6cm tall. Please click on the photos to see larger and alternative images. Please read the information on our delivery page regarding sending items made of glass to you.